"I'll just say this, as long as I'm still kicking, no animal will be harmed inside that fence." Every year sees its fair share of animated animal adventures, but 2006 has had more than ever. 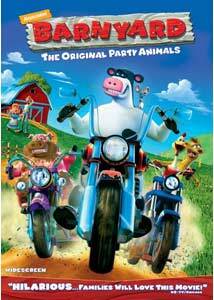 Don't confuse Barnyard with the superior Over the Hedge and Flushed Away, as this project from director Steve Oedekerk (Kung Pow: Enter the Fist, Bruce Almighty) is merely a slow, meandering clone of The Lion King. While my 3-year-old was astonished by the CGI-animation, my 11-year-old daughter, who likes everything, was bored during much of this. She might be close to the edge of Barnyard's target demographic, but if anything involving animals doesn't lock in an 11-year-old, there's trouble afoot. What appears to be a normal farm, turns into a raucous party spot whenever the resident farmer heads to town. Otis (Kevin James) is the bovine son of the barn's ringleader, Ben (Sam Elliott). Faster than you can say Simba and Mufasa, Ben is killed by a coyote, and Otis is the new leader. He would rather play with his buddies and chase after a cute "girl" named Daisy (Courtney Cox) then act mature, though. Otis isn't exactly surround by genius buddies to begin with—there's Peck the Rooster (Rob Paulsen), Freddy the Ferret (Cam Clarke), and Pip the Mouse (Jeffrey Garcia), to name a few. This motley crew might not be enough to keep Otis from avenging his father's death, and he might even become the "man" Ben wanted him to be along the way. All you really need to know about the ineptitude of Barnyard stems from seeing the main character: a male cow... with udders. There's "suspension of disbelief" and then there's a male cow with udders! The anatomy of a cow is more or less taught, albeit indirectly, in preschool or earlier, yet the filmmakers couldn't take the time to do away with this poor guy's udders, or, hey, here's a thought, make him look like a bull. His father looks more realistic (yet still with udders), so why saddle this character, whose relationship with said patriarch is the driving force of the story, with such an anomaly? Barnyard won't have you mistaking it for Shrek or other classic animated features, but it's not entirely terrible. There are some heartfelt moments and a few funny characters, but it's just too difficult to get past the obvious borrowing from other animated hits (and aforementioned udder thing). Everything also has sort of a low-brow feel to it, from the D-List voice talent, to the computer game-level CGI animation. I haven't even gotten to the look of the humans, who are either short blobs or skinny, acne-ridden surfer dudes delivering pizza. Sure, we get that this is all about the animals and humans are just in the way of their true lifestyle, but don't make them complete, useless dolts. On the bright side, it's rare for these four-legged creatures to randomly break into song. The down-home music that we do hear is pretty awful, but it isn't overwhelming and rarely annoying. Then again, I might have been too bothered by the rest of the movie to notice the music, so my judgment might not be entirely reliable in that regard. Overall, Barnyard is a tough one to recommend, but it's not one of the worst films of the year, if that's any consolation. These days, such a distinction just might be enough to warrant a rental. Image Transfer Review: This isn't the best animation you'll find, especially with today's technology, but the anamorphic 1.85:1 widescreen presentation makes the best of it. The colors are appropriately bright and vivid, while the detailed of the animated characters never wanes. Audio Transfer Review: The Dolby Digital 5.1 audio makes surprisingly poor use of the surrounds, exhibiting little in the way of channel separation. The rears do spring to life during a few of the action-oriented sequences, but most of the music stays up front. The dialogue is never a problem, remaining crisp throughout. 1 Feature/Episode commentary by Steve Oedekerk, Paul Marshal, and the Barnyard crew. Extras Review: There are quite a few extras, both kid-oriented and adult friendly. We begin with an audio commentary track featuring Steve Oedekerk, Paul Marshal, and the "Barnyard crew," during which they spend most of the time joking around with each other. While this makes this a fun listen, it would have been nice to hear a few more technical details involving the animation. There is a pair of music videos for the songs Barnyard Bop and Mud, as well as a five-minute segment called Boogying in the Barn, which looks at the band North Mississippi Allstars, who provide much of the music. Utter Talent—Voices of Barnyard is a 10-minute look at the talent behind these animated characters, while An Animator's Life takes 12 minutes to give us a look at the work technical director Chris Evans and the other animators did to bring the animals to life. Method Acting with Kevin James is only two minutes long, and has the King of Queens actor discussing his work on Barnyard. Seven deleted scenes, totaling just under 10 minutes in length, include a few cut musical sequences, as well as other, roughly-animated bits that were left out of the theatrical version. Finishing up the extras are promotional items, including the original theatrical trailer for Barnyard, a "Nick On-Air Campaign," featuring 13 TV spots for the film, a trailer for the Barnyard THQ video game, and previews for other Paramount Home Video releases. Kids can also enjoy some DVD-ROM features, including the Barnyard Comic Book Creator, a trio of interactive games, and a demo for the PC version of the game. It's not going to be nominated for the Best Animated Film Oscar this year, and there are plenty of problems with Barnyard, but I can't say it's not worth a rental. Paramount Home Video's DVD treatment contains quite a few extras, and nice audio and video.